I bow with reverence to You, my root Guru whose kindness can never be repaid. From the sphere of primordial wisdom may you look after me with great compassion and bestow your blessings. Therefore there is nothing which is not emptiness. If you understand this secret point, that all things are interdependent, you will naturally understand emptiness; the realization of emptiness is what we really need. All the various appearances of objects to the five senses arise through the power of the karma and disposition of living beings, but whatever exists for one sentient being does not necessarily exist for everyone. The different karmic appearances of the six types of lifeforms are an example. It is for this reason that Buddhism does not accept a world creator. 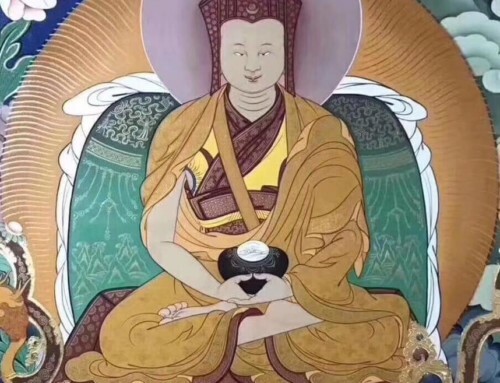 All the Indian and Tibetan masters clearly and extensively explain in their writings how this world arises by the power of imprints in the mind. 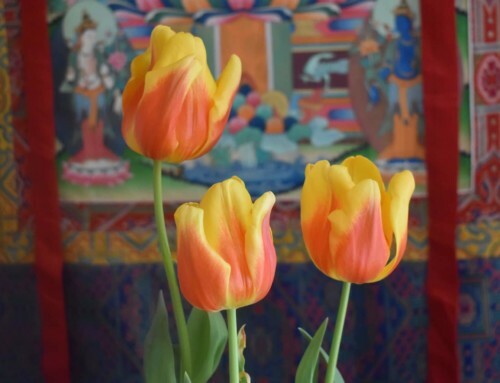 All sentient beings have their different appearances of objects of the external world. Taking this earth for example; for hell beings it has the nature of burning iron, for human beings it is ground to walk on, but for many animals it is a home. Water for human beings and most animals is something to drink to quench their thirst, but for hell beings it is molten metal, for hungry spirits it is pus and blood, for fish and other creatures it is their home, and for divine beings it is nectar; it appears differently to the six types of lifeforms. If you really check and investigate there is nothing which truly exists as it appears from its own side; that is what Buddha says. Other religions say that this world is made by God, but Dharmakirti, in his Commentary on Valid Cognition four hundred years after Buddha’s paranirvana, and Nagarjuna, in his Root Wisdom and other treatises, used four lines of reasoning of the Middle Way — the diamond slivers, the refutation of existent or non-existent results, the absence of true singularity or multiplicity in objects, and the great reasoning of interdependence — to refute and show the logical faults of this assertion, so there is no need for me to go into great detail about it here. Therefore, if objects do not exist from their own side, the happiness and suffering that arises in dependence upon them is also impermanent. For example, someone who is burning up with heat because of doing a lot of work in the sun wants coldness. They rely upon cold to free themselves from the painful heat. When the cold first touches their body for a few minutes the person feels a special happiness of body and mind. This is because of the existence of the previous heat. After a few minutes even that previous pleasant feeling of coolness will turn into suffering. Then they need to go into the sun again. On contact with the sun, they feel a special happiness of body and mind. Again, after a few minutes that pleasant heat of the sun turns into suffering, and they don’t want to stay in it. All objects of the senses are similar in this way. Feelings of happiness and suffering arise primarily on the basis of the mind; not because of the external object. According to the Middle Way Consequentialist explanation, objects of attachment do not exist self-sufficiently, from their own side: subject and object are only designated by the mind, relative to each other. For example, self and other, long and short, hot and cold, large and small, all exist relative to each other. Short is a label that is given relative to something long. The convention of ‘shortness’ cannot exist without something long. In this way all things are posited relative to each other and do not truly exist from their own side. If happiness and suffering existed externally, no matter how long you stayed in the sun it would just get more and more pleasant. It’s not like that. The present pleasant feeling itself becomes unpleasant. The objects of pleasure and displeasure do not exist from their own side. All contaminated things are suffering. All phenomena are empty and selfless. Son, appearances don’t bind you, craving them does! As he said, we should understand: if our attachment and craving towards objects is excessive, those objects will hurt us. All things of samsara are like that. Happiness and suffering do not exist in those objects, themselves. Having lived a long time in monasteries in the East I never had much contact with people in romantic relationships. Since coming to the West, however, I have had a lot of chance to observe the phenomenon and this is what I have noticed. In the love and affection between people there develops strong attachment. The friends, at first, see their partner’s body, speech, and mind, inside and out, as one hundred percent pleasant and good as they appear to be; they would even give up their life and all of their possessions for them. After a while, the attachment to the object of their affection wanes. Later on they see the person as an unwanted bad omen, and feel that, if they can’t get away from them, they won’t be happy at all. They don’t want to stay with them, and they see them as completely unpleasant on every level, outer, inner, and secret. Why would someone who seems completely charming at first later become someone you can’t bear to see? Your two eyes are the same as before, the object seen is the same as before. I’ll explain this logically. 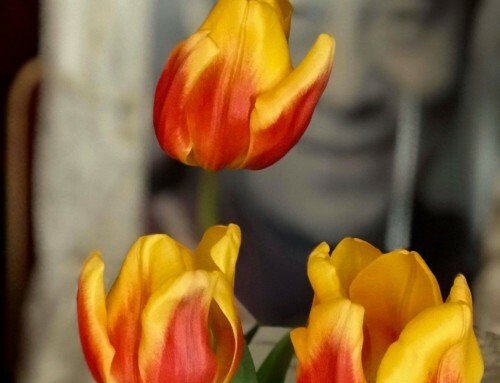 First, let’s think precisely about what Buddha said: ‘All compounded things are impermanent, and all contaminated things are suffering.’ If something is impermanent, then there is suffering. Whatever changes is under the power of other; it arises through the force of impermanence. The object itself has no choice but to change. We shouldn’t think it is the other person’s fault when they change because it is under the influence of forces other than themselves that they change from how they were before to how they became later. Rather, it is the delusions in their minds that are the real foe. If someone hurts us it is because of delusions in their mind. Therefore Buddha said that we should not consider the person as an enemy, but have compassion for them and consider the delusions in their mind as the actual enemy. Secondly, without first investigating the object of your attachment, many mistaken thoughts, such as of attachment, crowd into your mind one after another, connecting your mind’s way of seeing to the object of attachment. Because of this, what your mind sees is not objective and does not accord with reality. This happens a lot with our five senses. In any case, we must understand that happiness and suffering are not caused by the objects of our senses, but by the way we perceive those objects. Our way of seeing follows a mistaken awareness. The actual object does not truly exist as it appears, like a mirage or a dream. If objects of the senses were happiness, modern day people who are rich and famous should be happy, but they aren’t. As said in the Guide to the Bodhisattva Conduct. You should know that wealth brings endless ruin. Have no chance to be free from suffering existence. One who has wealth has suffering. He said that the more wealth a person has, the more mental suffering they have. No matter how much you enjoy desirable objects of the senses it brings no satisfaction and finally brings additional suffering. The best wealth is contentment. We can be sure of that. I want to tell a short story. I had an uncle, my mother’s brother. His name was Lama Gepel. 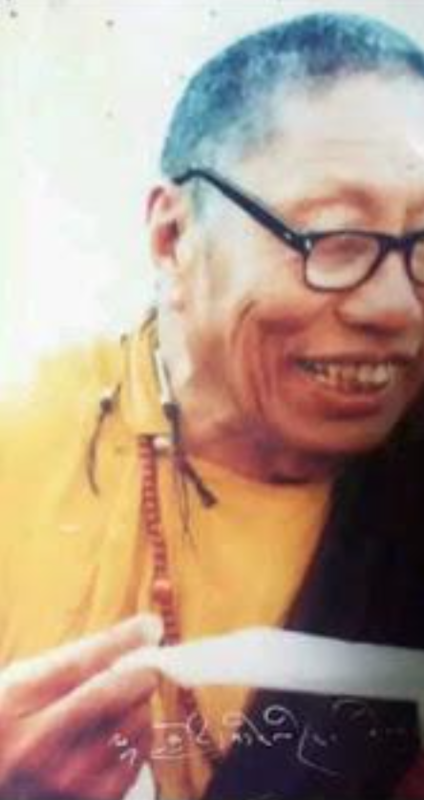 He was very holy and virtuous, the master teacher of Dege Zhechen Monastery. More than my uncle, he was the teacher who helped me most of all. He was a very honest and direct person. If I made a little mistake he would scold me. If he were still alive he would be in his nineties. Unfortunately, he passed away in 1996. About two years later his eye disease got worse and he went completely blind again. He stayed doing practice, never leaving his meditation seat throughout the day and night. When we again begged him to please let us take him to the hospital, he said in a very decisive way, ‘Previously, up to now, pursuing what these water-bubbles of my eyes saw, I don’t think there was anything I didn’t see, but I never saw anything very wonderful in the world. Everything I saw was the same. Better than shapes, colors, and so forth, now that I am blind I see something I never saw with my eyes. I don’t want to give up this amazing display! My root Guru and the Three Jewels have given me this blindness but I wish they had given it to me earlier! I am never going back to the hospital! Don’t be disappointed!’ He lived with his blindness for about eight more years, before he died in 1996 amidst amazing signs. Many people seek happiness by chasing after the objects of their senses. True happiness, however, is found only in the mind, not outside. Buddhas above and sentient beings below see the same things, but Buddhas see them without dualistic grasping, like they are illusions or dreams. We ordinary beings grasp them as truly existent, never doubting that they are real. Toward those things which appear pleasant to us we develop attachment, towards things which appear unpleasant to us we develop aversion, and towards things which appear neither pleasant nor unpleasant to us, we are indifferent. We grasp these objects which ultimately do not exist from their own side as if they did exist from their own side. It is like, in the darkness of dusk, mistakenly thinking that a striped rope is really a snake. Forms are like bursting bubbles. And consciousness is like illusion. Accordingly, as Buddhas enjoy objects of form, sound, and so forth, they view them without grasping, like unreal illusions. Without rejecting objects of the senses we should give up grasping them. Even if we had to abandon external objects of form, sound, etc, there would be no way to do it. It is better to give up the dualistic mental grasping within us; then the appearance of external objects can’t hurt us. With leather, where would we get it? It is just as if we had covered the whole earth. This is a very good example. Even if we had to cover up externally grasped objects, we could not, and it would be meaningless. Shantideva is saying that it would be better if we could take control of our own mind. Thus, it is better if we don’t deceive ourselves by thinking that desirable qualities of outer forms, sounds, and so forth provide true happiness. Understanding that ultimate happiness comes from within, we should think about what the best method to attain it is, and how to find that method. With this, I’ll conclude today’s blog. We will never be satisfied; it is like scratching a rash. We will see happiness arise from within. Having few desires and contentment is the king of wealth. 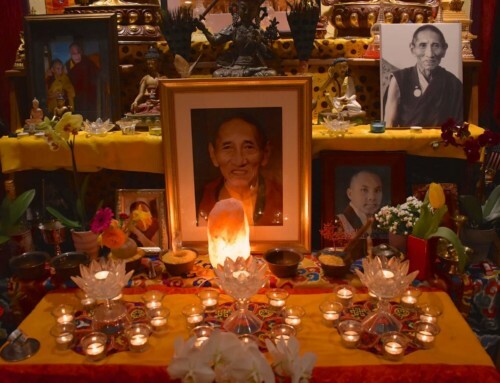 Altruistic Bodhicitta is the essence of Dharma. Don’t seek happiness outside; seek it within. Of contentment, it is a treasury of stainless qualities. The more you drink it the thirstier you become. 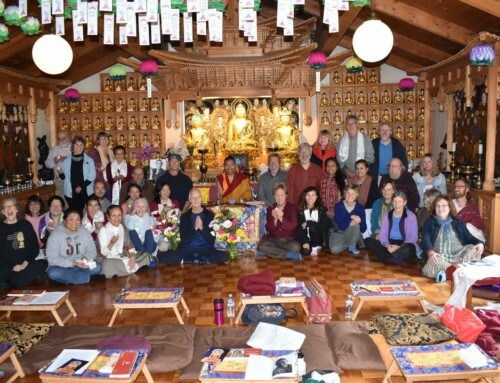 Hoping that this would benefit my Dharma friends, Khenpo Karten wrote it September 14, 2018.